LIFE EXPLODING 1. Why Fiji is called the "soft coral capital of the world." 2. Tavoro Falls on Taveuni. 3. A gorgonian crab tries for invisibility. 4. The warty egg cowrie: a beautiful Fijian gastropod with a most unbeautiful name. Ask divers who have been around the world a time or two, and they will usually tell you that one of the very best soft coral dives in the whole wide world is The Great White Wall off the island of Taveuni in the Republic of the Fiji Islands. That's a pretty tall claim for a country that has less dry land than New Jersey. And what's even more remarkable is that it is probably true. Year-round, but best viz is in October. 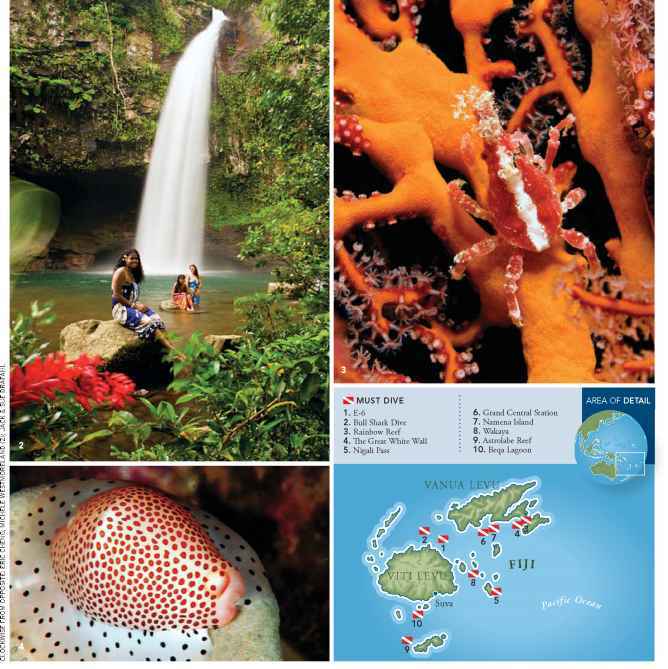 WHAT TO EXPECT: The very best soft corals in the world, creatures great and small, and a broad range of dive conditions. Be aware that plankton blooms can affect visibility (but help provide healthy corals). LANGUAGE: French, but with patience you can get by on English. TAXES: VAT varies year to year; currently around 12.5%. Hotel "turnover tax" of 3%. ELECTRICITY: 240 V; bring a conver-tor. TIME ZONE: GMT +12 hours. tinuing surprise and delight of traveling divers. 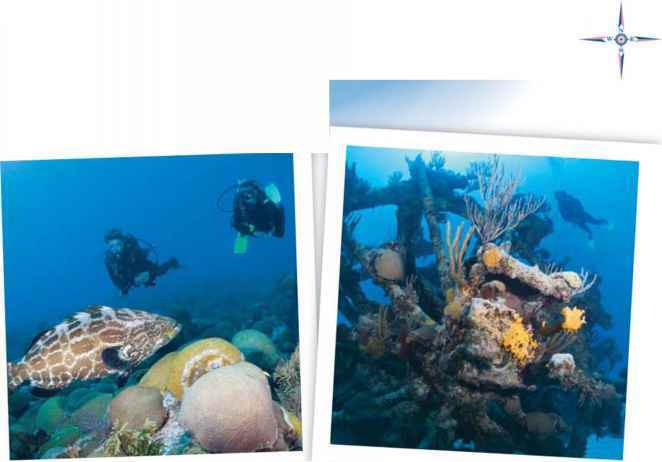 There is so much reef here that virtually any diver can be an explorer, probing the nooks, crannies and mysteries of dive sites never before seen by man. 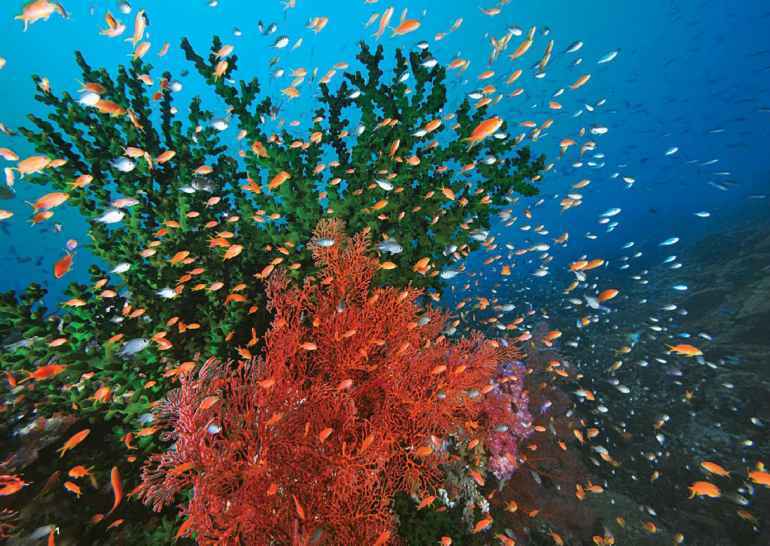 Knowledgeable locals estimate that less than one percent of Fiji's diveable waters have been explored. The soft coral capital of the world is the setting for underwater encounters with pelagic sharks, tuna, turtles and tropical Pacific fish of all shapes and sizes. And the rugged green islands are home to some of the most naturally garrulous and friendly people you will ever meet, eager to tell you about their home and equally eager to ask you about yours. You'll find it easy to understand why this stunning nation is truly a legend worldwide.